1. 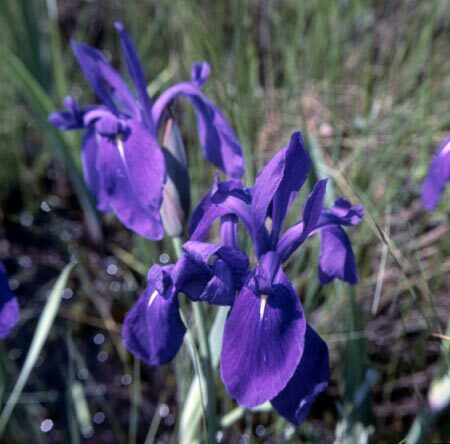 Iris Linnaeus, Sp. Pl. 1: 38. 1753. Herbs perennial, usually with short or long rhizomes (or bulbs), sometimes with swollen storage roots. Leaves mostly basal, 2-ranked, often oriented edgewise to aerial stem, sword-shaped to linear. Aerial stem developed, much shorter than or longer than leaves. Inflorescence of rhipidia arranged in racemes, panicles, or solitary. Flowers white, yellow, blue, violet, or purple, relatively large, often fragrant. Perianth tube usually trumpet-shaped, sometimes very narrowly so, very short to long; outer 3 perianth segments (falls) ornamented or not, with a crested, bearded, or beardless claw (haft), and an expanded, usually reflexed limb (blade), the beard or crest (when present) extending along midvein of proximal part of limb adaxially; inner 3 perianth segments (standards) smaller, never ornamented, erect or spreading. Stamens opposed to style branches and appressed to them; filaments free, flattened. Style with 3 colored, expanded, petaloid branches, arching over stamens, apex of branches extended as 2 lobes (crests) projecting beyond flaplike, abaxial stigma. Capsule globose, ellipsoid, or cylindric, apex beaked or not. Seeds pyriform, flattened and D-shaped, or irregularly angled, sometimes arillate. About 225 species: temperate regions of the N hemisphere; 58 species (21 endemic) in China. The following species were recorded in FRPS as being cultivated for ornament in China. Large species with bearded outer perianth segments: Iris germanica Linnaeus (with spathes at least partly green) and I. pallida Lamarck (with papery spathes). Large species with beardless outer perianth segments: I. sibirica Linnaeus (similar to I. sanguinea but with scarious spathes and longer, unequal pedicels); I. pseudacorus Linnaeus (similar to I. maackii but with leaves with an obvious midvein and larger flowers); and I. versicolor Linnaeus (similar to I. laevigata but with a more branched flowering stem and smaller flowers). White forms can occur in most species and have been treated variously.